Back to the hospital as Eva is trying explain where Josefine (Stina Sundlof) went, Tom Aronnson (Richard Forsgren), another cop, has a suspect in mind, “If someone took her, it has to be you.” Meanwhile, one of the boys from the swamp goes to lead detective Goran Wass (Goran Ragnerstam) about “shooting someone,” but then has a complete melt down at the station. Wass and Tom are also investigating the murder of a weirdo cabbie, but we know Wass has something to do with a conspiracy surrounding Silverhojd and the disappearance of the young boy everyone is searching for. They get a lead on the kidnapper and uncover a massive supply of guns and explosives in a salvage yard, the owner dead. Wass is such a shady character. He tracks the swamp body to a cave, and seems to have a way to call it. He’s also digging around through swamps in an effort it seems to clean up after it. One thing is for sure, every time Jordskott closes a door, it opens several more. Tom and Eva’s relationship develops more complexity. He is obviously suspicious of her and resistant to working with her at first. But we find out a bit about Tom that shows he bares more than a few similarities with Eva, including him having a daughter, an autistic one he rarely sees. At the salvage yard, she is aggressive to find the missing children to the point of nearly setting off a booby trap, but Tom saves her at the last minute. The kidnapper/murderer remains unnamed, but he has friends in high places who help him relocate after his police sketch is released to the public. Everyone seems to be related or connected and the mysteries of Silverhojd and the Thornblad factory grow every minute. And just when you think the episode can’t get weirder, Eva returns home to find Josefine sitting calmly on the steps! There is another murder of another semi-crazy old timer, which does not bode well for Tom as he’s to spend time with his daughter. Goran Wass shows up and he continues to be shady as heck, the body has matching scars to the body of the cabbie, who we learn was the old man’s brother. Eva is dealing with Josefine’s shocking return and receives word that her hospital tests came back and the disease is spreading. The doctor says only surgery to remove it could help, but it’s so risky he wouldn’t even recommend it. 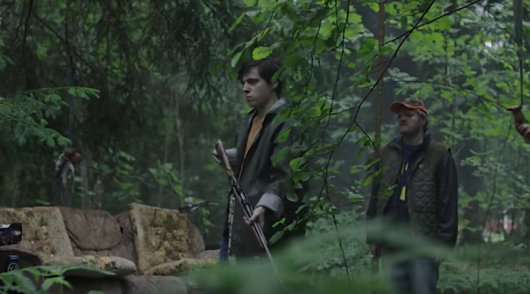 The older boy who shot at the swamp monster man last episode is clearly mentally disabled and beaten on by the two he “ratted on.” The connections get deeper as his mother is Gerda (Lia Boysen) who works at the cellulose factory and fathered a child with one executive, Goran Boren (Peter Andersson), and was having an affair with the other (Eva’s father). Oh, just to weave this complex web thicker, Goran also is funding the killer. Speaking of Eva’s father, we see more of his home recordings as he suffers from the same parasitic disease Josefine has. There was a strange bottle covered in corrosive hogweed outside Eva’s home. She encountered hogweed when she first saw the murderer/kidnapper suspect so she goes back there to investigate and finds a cave that connects to a tunnel which leads right to her Dad’s house! The swamp body recovered at the plant sans head, hands, and feet is examined, and yuck, that scene is NOT for the feint of heart. The executives at Thornblad Cellulose acknowledge they hired the man in the white pick up, and he needs to be stopped before it gets out that they’re funding a murderer. When Goran meets with him and accuses him of “killing innocents” the man listed in the credits as Harry Storm (Ville Virtanen) reveals the truth. There are monsters living in Silverhojd, monsters who removed their tails (hence the scars) who are responsible for the kidnapping of Anton and others. And things just got super duper bizarre. Add to that when the coroner goes to show Wass the “strange” corpse it liquefies in a disgusting ooze all over the floor. Eva is visited by Tom and his silent daughter Ida (Mira Gustafsson). All the scenes involving Tom and Ida are moving. He obviously loves her, but his ex wants her far from him and his career. Again this serves to bond him with Eva. She confides that she’s starting to doubt the man in the white truck had anything to do it and they’re oblivious to Josefine wandering around scraping for food. Eva takes a chance a feeds her the bottled liquid and it’s just what the doctor ordered. Later she hears creaking from the door to the tunnel and finds another bottle left with clues as to what’s going on. There are two huge wildcard characters in Jordskott: Wass and Harry Storm. We have no clue who (or what, maybe) Wass is and what his objectives are, and Harry went from psycho killer to maybe hero in the span of an episode. Four episodes in and I don’t really have a firm grasp of what’s going on, but I am so intrigued I can’t turn away. This show has a LOST season 1 vibe to it, where it teases answers and then tosses out more and more questions to hook you more. The cinematography of the Swedish landscapes is absolutely stunning and the writing and character development is really fantastic. I’m actually rooting for a love story subplot with Eva and Tom. These two episodes push Jordskott in an entirely new direction, whereas the first two were more crime thriller, these tilted toward sci-fi horror and got the hair on the back of my neck standing up at times. Shudder releases the next two episodes of Jordskott on Thursday, April 20th. Shudder is $4.99 a month and worth every penny for horror fans. Jordskott is one of many new and exciting exclusives they are getting to their channel.